A Black Forest hotel could not be more traditional. 44 comfortable and cosily furnished rooms await you here under the hipped roof. With the Ravenna Gorge in the rear, the hotel is situated in such a way that you can be on your way on the most beautiful hiking trails within a few metres. 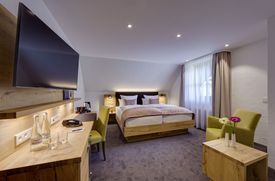 Standard: cozy Black Forest -our rooms on the cuckoo level. Black Forest Deluxe: spacious Black Forest - these rooms tempt you with a spacious interior design and seating area in each room. Family Apartment: Black Forest for the family - spacious 2 rooms with fine taste. 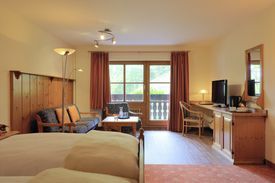 A cosy Black Forest style room (20-25sqm) for your well-being in the SchwarzwaldHaus. 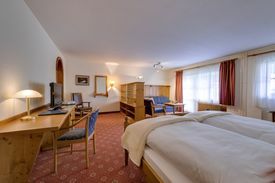 Spacious rooms (25-30sqm) with seatinn area in the SchwarzwaldHaus. The superior rooms (20-25sqm) a mix of wood and modern chalet design in the SchwarzwaldHaus. 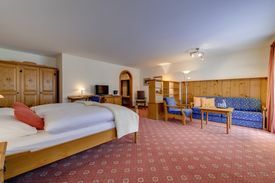 Friendly large rooms (35sqm) for up to 4 persons with a double bed and an additional sofa bed in the SchwarzwaldHaus. These rooms are perfect for a short family holiday! Spacious apartments (40sqm) in the SchwarzwaldHaus with 2 separated bedrooms (up to 5 persons) are perfect for families.